Having witnessed AMD shake up the desktop CPU landscape with the introduction of its Ryzen processor family, we've been itching to see how the company will fare in the laptop space with Ryzen Mobile. AMD hasn't held a meaningful slice of the mobile market for quite some time, and though the initial signs are positive, it remains to be seen whether or not Ryzen technology will be utilised in laptops that today's consumers actually want. 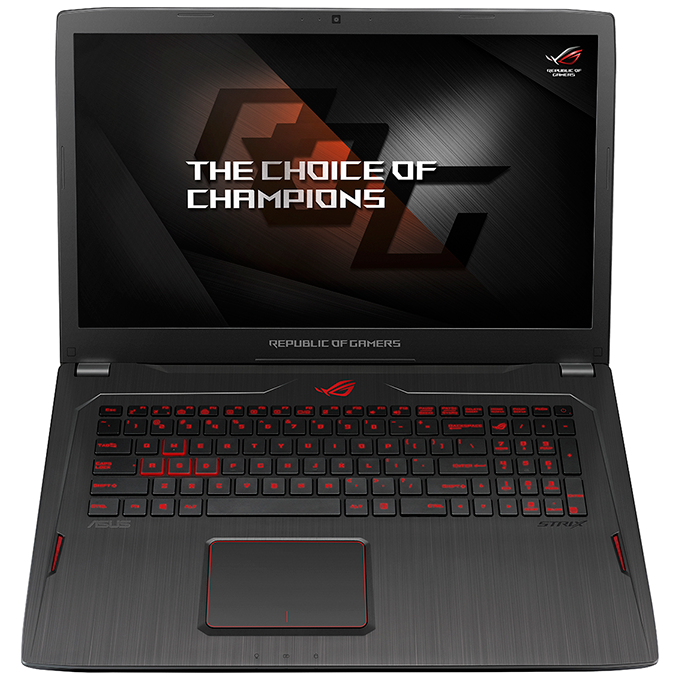 Hoping to get a jump on the competition, Asus isn't even waiting for Ryzen Mobile, and is instead offering something different to the established Intel crop in the form of the ROG Strix GL702ZC. 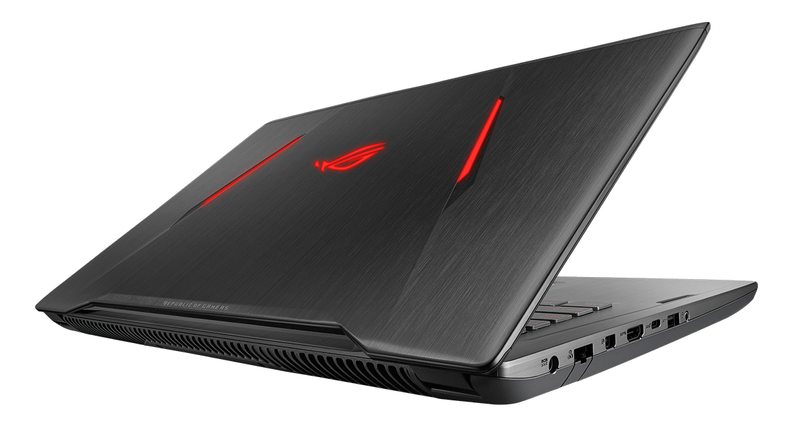 At first glance it looks a familiar machine - similar chassis have been employed by other models in the ROG Strix range - but the GL702ZC sets itself apart by being an all-AMD affair. 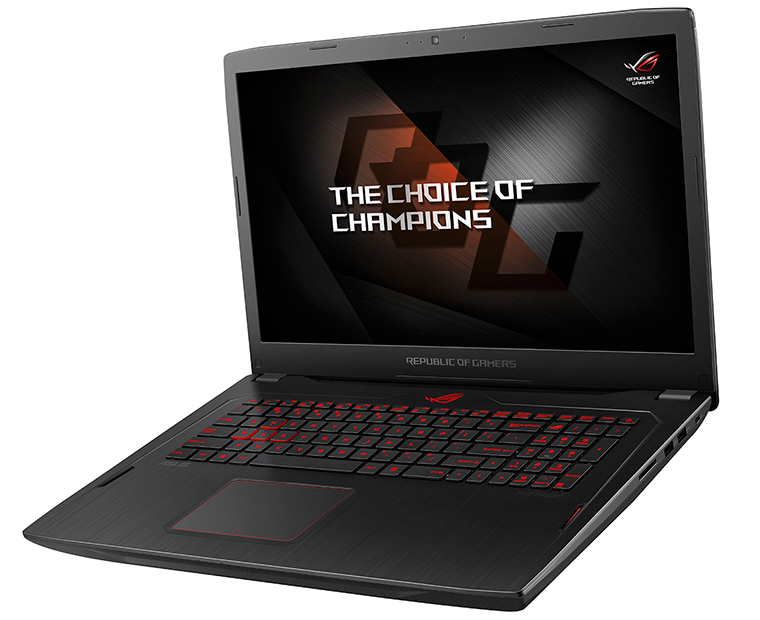 If not Ryzen Mobile, what is Asus using at the heart of this 17.3in beastie? Rather than play it safe, the GL702ZC goes for the jugular by incorporating a desktop Ryzen 7 1700. Yep, we do mean the impressive 65W chip brandishing eight cores and 16 threads. This is a laptop intended to demonstrate AMD's return to the fore, and that means Nvidia's ubiquitous GeForce GPUs are out; GL702ZC's graphics come courtesy of a 4GB Radeon RX 580. The choice of GPU poses something of a conundrum. It's refreshing to see an all-AMD laptop, and the Radeon implementation is bolstered by a FreeSync display, however RX 580 isn't exactly a hard hitter. Performance is typically comparable to a mid-range GeForce GTX 1060, but this isn't RX 580 in full 185W desktop form. Given the space and cooling constraints, Asus wisely downclocks the GPU by 20 per cent from 1,340MHz to 1,077MHz. No surprises there, but given that Ryzen as a platform is known to benefit from quick memory, it's a shame to learn that the GL702ZC is shipped with a single 16GB stick of DDR4-2400 memory. Adding a second module is straightforward given the spare slot, yet for the sake of out-the-box bandwidth we'd have preferred a dual-channel configuration as standard and slightly quicker DIMMs wouldn't have gone amiss. Elsewhere, the specification is pretty straightforward. Storage is provided by a 256GB SanDisk X400 SSD and a 1TB Seagate hard disk, Windows 10 is the pre-installed OS (complete with a few pieces of bloatware), and though the 76Wh battery sounds quite generous, we don't imagine it will last long with this particular combination of CPU and GPU. In terms of connectivity, GL702ZC's left edge is home to a port for the brick-like 230W power supply, as well as Gigabit Ethernet, Mini DisplayPort, HDMI, USB 3.1 Gen 2 Type-C, USB 3.0 and a combination audio jack. Over on the right there are two further USB 3.0 ports alongside an SD card reader. There's no sign of Thunderbolt, but WiFi duties are handled by an internal Realtek 8822BE adapter, and getting inside the machine is relatively straightforward - simply unscrew the bottom panel for easy access to memory, storage and battery, or for cleaning the dual fans and numerous heatpipes who combine to expel hot air through a rear vent. The fact that we're focussing almost entirely on the internal hardware is a sign of how rare AMD laptops have become. We can't actually recall the last time a manufacturer wanted to send one in, so the GL702ZC is a welcome change. 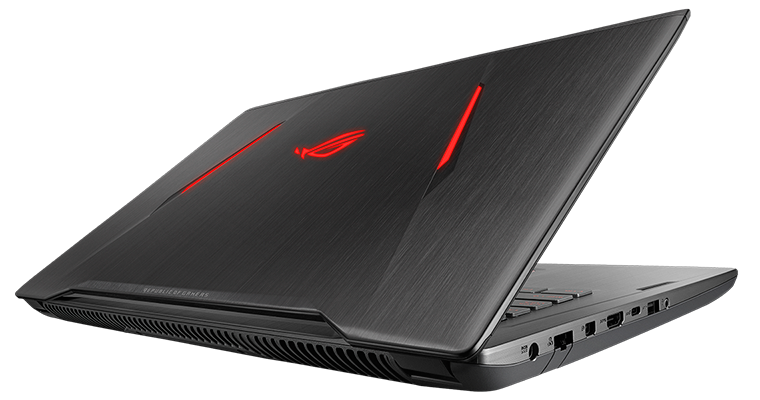 We're intrigued to see how it performs, but in terms of look, build quality and usability, the ROG Strix isn't anything to write home about. The 415mm x 280mm x 34mm chassis is both bulky and plasticky, a 3kg weight limits portability, while red LED backlighting on the lid and keyboard add an extra garish quality. From an aesthetic point of view, it's an acquired taste. 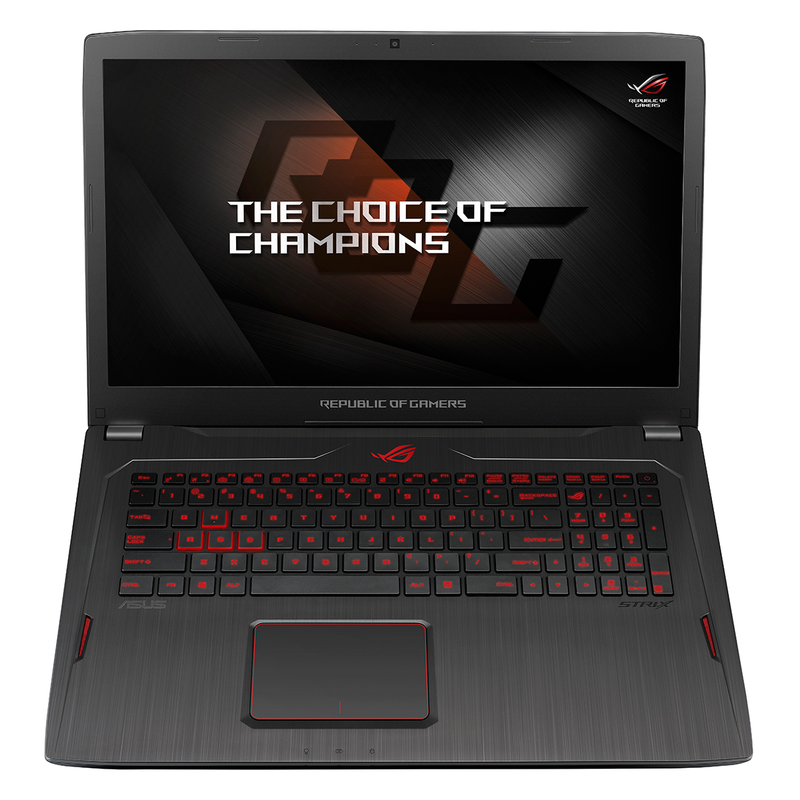 But if you happen to like the gamer visage, you'll appreciate the GL702ZC's finer qualities. The 1080p IPS display panel, for example, may be basic in terms of resolution, but offers excellent viewing angles, is well suited to the capabilities of the RX 580 GPU, and comes equipped with FreeSync support in the 40-60Hz range to help eliminate choppy gameplay. The backlit keyboard offers decent travel as well as an integrated numpad (though NumLock isn't where it ought to be), the trackpad is roomy and responsive, while the stereo speakers pack a decent punch. AMD is often seen as the value alternative, and the GL702ZC is priced accordingly. The eight-core model in for review carries a £1,600 MSRP, but is available for £1,450 from Amazon at the time of writing. That's less than a hundred pounds per CPU thread, which is pretty much unheard of in the high-end laptop space, and if you do need to keep costs down, a second model outfitted with a six-core Ryzen 5 1600 is currently available for £1,350. Pricing is competitive, but before we get ahead of ourselves, can the laptop actually cope with desktop-grade components? Let's run some benchmarks.